Fortunately jack-knifing and caravan snaking claims are relatively uncommon amongst Caravan Guard customers (accounting for just 1.6% of claims in 2012), but when they do happen, the damage to the caravan can prove catastrophic. We reviewed snaking and jack-knifing claims during 2011 and 2012 and found that the average claim cost came in at over £8,000! In extreme cases the driver can lose all control, which will likely cause a serious road accident. These kinds of incidents cause major disruption and can lead to other road users being caught up in the collision. We’ve come up with a few things you can do to help make sure you’re not one of the unfortunate few affected by snaking and jack-knifing. What is caravan jack knifing? Jack-knifing occurs when a tow vehicle and the caravan lose sync and remain fixed at an L or a V shaped angle, stopping both car and caravan from going any further. It’s caused when the caravan loses grip on the road known as traction, and is forced to pivot heavily on a towbar. Unless the caravan hits something solid, like the back of the towing vehicle, this can continue for some time. Snaking is very similar to jack-knifing in the way the caravan is destabilised and moves horizontally around the towing hitch axle causing it to veer side-to-side. Caravan snaking is caused by sudden swerves, high speeds and crosswinds mainly but noseweight, tyre blow outs and poor towing can also be a factor. What can be done to prevent caravan jack knifing and snaking? Caravan safety devices have come on leaps and bounds in recent years and do a great job in helping to reduce caravan insurance premiums. A standard caravan stabiliser may produce a more smooth towing experience. Caravan Guard reward customers who fit electronic anti-snaking stabilisers such as AL-KO’s ATC or BPW’s IDC with an insurance saving of 5%. The AL-KO Anti-Snake Trailer Control (ATC) system is fitted to many new and recent caravans and or be retrofitted to an older model for around £587*. The ATC electronic anti snaking device automatically applies the caravan brakes if it detects a snaking motion begin to occur. See the AL-KO anti-snaking device in action. AL-KO stabilisers retail from around £239 and are designed to give drivers more steadiness when towing. Similarly, Tyron safety bands help drivers to stay in control and avoid an accident in the event of a blowout and will get you a 5% discount on your caravan insurance with Caravan Guard. A tyre blowout can happen as a result of snaking, putting huge pressure on the caravan tyres. Tim Booth, Leisure Vehicles Officer for the AVCIS Vehicle Crime Intelligence Service, highlights another less obvious cause for snaking and jack-knifing. More important than the latest safety gadgets is good towing practice. If the caravan and towing vehicle are improperly balanced, the caravan may be more inclined to sway into a jack-knife position. This is easy to avoid though, simply load weight in the caravan evenly, putting the heavier objects as low to the ground as possible in order to create a low centre of gravity. See our article on correct caravan loading. Remember that the towcar and caravan should be a good match – find details of the 85% rule on our correct caravan loading article via the link above. Excessive speed is a major cause of snaking and jack-knifing amongst caravan owners, which is why it’s so important to know the speed limits on all UK and European roads. Is the caravan load correctly distributed and firmly secured? Check caravan tyres and towcar tyres. Are tyre pressures correct and are the tyres in good condition? Is the trailer correctly coupled to the tow ball or pin? Is the caravan noseweight ok and is the coupling height level? What can I do if you do experience snaking? Don’t be tempted to remain on hard shoulders for long – they can be dangerous places to be. By fitting recommended safety devices you can not only save money on your caravan insurance premium but it will also help to reduce the risk of jack-knifing and snaking. Have you ever experienced jack knifing or snaking? If so, tell us about it and share any tips to help others avoid it in the future. Simply enter your comments below. but this means the brakes will need more maintenance. In “Differential Stability” the system is “Proactive” since very small natural sways are controlled by the hydraulic damper up to the extent that “Simple Harmonic Motion” is acting, over that the individual brake action just kisses the appropriate brake to control the acceleration of that wheel and keep the trailer inline – just like your “Mover” does. Since this is not trying to slow the whole combination the wear rate on the brakes is minimal. In practice it means the driver will only feel a sway following a severe push but this will immediately be stopped as it returns to the centre of equilibrium. It works without any electronics. It is difficult to diagnose a particular issue such as this without first hand inspection, however,if the caravan had no material change and it occured since the tow vehicle was changed then it would be prudent to check the tow vehicle tyre pressures and front wheel geometry. The tyres present a slip angle when a side force exists therefore the pressures are critical in that if the pressure is too low for the load the tyre slip angle increases and this can create an imbalance between the front axle tyres and the rears. Almost all modern cars aim for a understeer characteristic exhibited when the front axle tyres have a greater slip angle than the rears so if the the rear tyres are running with pressures too low then the slip angles may be greater than the front and create instability when either cornering or when a side force exists similarly if the geometry is out. With a trailer this effect is less troublesome, however, it could be a problem if they are running severely flat since the lateral inertia will display some additional sway. If the trailer is balanced with the appropriate nose heavy bias it should not become an uncontrolled sway as long as the speed is below the natural sway frequency. However, there are many reasons why an uncontrolled sway can commence therefore, the only remedy is a proactive control system to mitigate the immediate danger. as soon as it does move with natural turning during use – laws of friction. Hence why the manufacturers refer to it as a “primary” device. The only solution is a Proactive Differential Stability device to stop it before it can start. Hi just got back from our annual tour of France and after 2500 miles I was on the M11 heading home when confronted by a foreign artic going slower than my 60 mph so I signaled to pass and proceeded. In this situation you have to keep your eyes ahead since any side wind can push you into trouble, when I estimated I was clear I checked the mirrors and could not see the truck. I then felt the push and pull of something alongside – the truck had accelerated up my inside and then the suction of the truck and my caravan was pulling us together – I dare not take my eyes off ahead and my wife said he was about 6 inches from the side of us. I was trying to pull away but with great difficulty – the truck also pulled away onto the hard shoulder and we eventually parted with no contact – phew. The day was saved by my Differential Stability System keeping the combination straight and true at 60 mph with no hint of sway despite a severe avoidance reaction. I designed it to also cope with a jackknife something that no electronic device can do. I will give my caravan with the device fitted Free of charge to any reputable company who can take it to market subject to an agreement and due diligence. Hi read what Allan Green says: This is an easy one for me to answer since I have found the solution but getting it recognised is like treading sand. I think Allan would take comfort in knowing that he did nothing wrong – it is an inherent problem with trailers that not one company has identified because they concentrate too much on electronic technology before understanding the causes of uncontrolled sway – I have kept my system under wraps to date and I can declare that there is no prior art in the patent applications that apply the simple answer to the problem except mine. For the past 4 years I have developed a system that works which I call my “Differential Stability” – I actually designed it over 20 years ago but pulled it off the shelf to fit it to my single axle Bailey. I have done the maths as well as all the trials to perfect it and have been in some very difficult terrain across the Massive Central in France. It employs a powerful hydraulic single damper combined with an innovative mechanical arrangement to apply individual braking to either side when a sway reaches a specific inertia – the key to its success is that it does not use any electronics or motors and applies a correction before a sway can start by applying an equal and opposite force at the centre of equilibrium – that is when the sway returns to the online position and no further after it has been pushed out of line by any wind force ( at half the sine wave) No other device on the market can do this except mine. It is not affected by speed and sensible loading with a bias to the nose has no affect either. I carry two electric pedal assisted mountain bike on the back of my van and as long as the van is not over loaded and maximum nose weight is on the ball. It does not slow the combination down in operation as some electronic applications do when they cannot discriminate between a bump in the road. I can be retrofitted to any caravan or trailer at a cost of about £200. I would invite any competent company to contact me if they are interested in marketing it. Doesn’t sound a good experience at all Kevin. Who is your breakdown provider? I have recently bought a Jeep Cherokee kk Limited diesel and I tow a Bailey Senator California single axle caravan.. the problem is that although the caravan is fitted with the Al-Co AST system, the caravan snakes badly on uneven left hand bends when doing over 80 kh. The Jeep is rated to tow around 2200 kg. The caravans that I am towing would not be more than 1600 kg max. The downward hitch weight appears to be well with in the Jeeps limits. At the moment the caravan is with a experienced RV repairer, but up to now he is stumped and does not know what is causing the problem. Does anyone know whether it would be wise to fit a weight distribution device as well as using the AST that is fitted. If some one out there has any ideas to fix the problem I would be extremely grateful. By the way, before I bought the Jeep I towed the caravan with a 2011 2lt Ssangyong Karando diesel with absolutely no problems at all. Something could have gone wrong of course during the change over. Anyone got any hints and tips for Dave…? Try towing the caravan with a different vehicle to pin down which is causing the problem. It may be that the Jeep has a worn shock absorber or suspension play on one side. I am a qualified transport engineer with 40 years in the Automotive and transport industry. Most of the comments are hitting the correct buttons, however, some in the wrong order. The route cause of snaking is the wind, it is the same issue that caused the Tacoma bridge to collapse in New York City and many other instances. Today we know how to cure this using designs and spoilers to great effect like on the Millau Bridge in southern France and tall buildings anything else is a sticking plaster. Before I fitted or activated any passive device I stood my van in a strong wind and placed smoke generators at various point to see where the problem starts. Wind/van speed is critical and even head on does not require much for a vacuum to start on one side or the other – when it does it just gets going like your Arial in the wind. I made up some spoilers to fit in the awning track and played with them until I found the sweet spot – bingo. Then just as a back up I always have at least one coupling anti-snake – my preferred one is the AL-KO hitch, always fit shock absorbers to the van axles if they are not already on, in addition I have designed, tried and tested a device to dampen vertical bounce between the van and car which also assists the van wheel and hitch dampers to keep the wheels on the ground, I fit car suspension stiffeners to the rear springs to help keep the combination level and load the van to the limit the tow bar allows which leaves a lot to be desired on many at 65-75 kg – this gives your coupling device the best advantage of stopping the oscillations because there is less leverage for it to cope with. Always fit TPMS to the caravan tires – they measure temperature and pressure – an absolute must have today. You must remember that any device can only get you out of trouble for that instance and that goes for any active ATC – the problem will start allover in seconds after they have been deployed and released – you cannot possibly carry on on a long journey with ATC switching on and off every time a lorry passes you or the wind is too strong etc. The other thing is do not depend on electronics they do fail and being electrical, blow fuses, jam up and cannot think as quick as you can. Remember that wind resistance increases at the square of the speed – the magic number is 60 mph in the UK and 58 mph in most of the EU for caravans. In three thousand miles of travel around France I have not experience any instability. Passing trucks do give a very slight pull together because of the vacuum they create but the combination settles back without any oscillation. One other thing – learn how to check and adjust the Van brakes never rely on the once in a while service – it will also keep you fit. As a by the way- I fitted dash cams in the van front and rear they are very useful – not just for security – they measure the driving features such as braking and bounce and capture the moment in a separate file – I got masses of data from these. Safe driving to you all. Many thanks for getting in touch. It’s great to hear from someone with real expertise. I’m sure other people on the blog will find your tips, advice and insight very helpful. I have often wondered whether using a roof deflector on the car has any beneficial effect on stability? Does anyone know? Do they actually work to improve economy? Caravans are arguably the most efficient design you can get in terms of fuel saving with the exception of what I put in my long winded post – I would say you will not benefit much from roof mounted deflectors but as I found out – side corner mounted spoilers do reduce snaking if designed and placed in the right spot. See my post. It is all too easy to let the speed build up after cresting a hill – you have to back off the throttle much more than when solo because you have been using much more power to lug up the hill. My one snaking experience came is similar circumstances – speed build up after cresting a hill and the snaking triggered a panel van going past at about 80mph at the wrong moment. I was inexperienced at the time. It was very scary! Now I have cruise control I use it a lot when towing. Once you are going too fast downhill, you are in a catch22 situation, because you need to slow down, but lifting off or braking reduces stability because the caravan is pushing the car. Presumably Andy had a stabiliser (e.g. Alco) of some sort? Does the Audi have the towing stability control feature that is activated when the towing electrics are connected? You may need to have a specific towbar installation for it to activate. What is the MTPLM to car Kerb weight ratio? Certainly he needs to check the noseweight on a new caravan. Plus keep a close watch on speed at all times! I bought a lunar clubman si 2010 from a big dealer two days ago and as an experienced caravaner, loaded it carefully. On two downhill straights snaking happened. My 2009 audi avant a4 auto transmission tdi is perfectly matched l think. What I did not have with me was a hitch weight tester. By hand I reckon the hitch may have been quite heavy but I didnt see any car tail sag or nose heavy look to the caravan. My ideas so far are to add around 6 lbs pressure to the car rear tyres and to check hitch nose weight and try different weights. Has anyone got preferred nose weights or other ideas? And the snaking ocurred reducing downhill speed from 65 to 60mph. Yes I know that I should have been below 60, but speed can creep up on lone downhill runs almost without you noticing. Many thanks for getting in touch – no doubt that was a scary experience for you. I’m sure your fellow caravanners will have some other ideas, can anyone help Andy with this one? Some of the previous comments about accidents and incidents have frankly horrified me. Whilst I applaud the many suggestions about making sure your outfit is thoroughly prepared beforehand, what would be the best action to take if you then actually find yourself in such a terrifying situation. I would suggest that slamming on the brakes would be just about the worst and most dangerous thing you could possibly do. If the caravan is swinging wildly to one side or the other at the moment of slamming on the brakes the forward momentum of the caravan could result in it literally trying to overtake your car( a jackknife, or worse). So what could you do to bring your outfit back into your control. May I offer to you a tale of my own experience almost 50 years ago. As a 21 year old I towed an old 22′ 6″ single axle caravan to Corsica. My towing vehicle was a short wheelbase 10 year old clapped out Land Rover with a 1600 cc petrol engine. The steering was so worn that I could move the wheel 50 mm in either direction before the road wheels started to move (no exaggeration). There were no stabilisers so, as I was soon to find out, every breath of wind would cause the caravan to snake, moving the back of the Land Rover violently to the left and right. I had only travelled a mile, literally, into my 1000 mile journey and I was so frightened I almost aborted the whole journey. But so much had been invested in time, money, ferry bookings etc., that I kept going a little longer. Then I noticed something very interesting. Whilst going round a bend the caravan stopped snaking (centrifugal force pushed it outwards) and if I went through a series of left and right bends the whole rig behaved in a normal manner until I reached the next straight when the caravan tried to do an impersonation of a windscreen wiper. It was a case if the tail wagging the dog. I started wishing, in vain, that the whole journey could be on winding roads with no straights. Then it dawned on me that I could do just that by acting proactively and not by reacting to the movements of the caravan behind me. If I constantly moved the steering wheel subtly to the left and right in rapid succession I would be creating my own winding road scenario even on straight roads and would regain control of the rig. It worked, and although it was very tiring, because of the concentration required, I managed the whole journey without incident. I had restored the balance back to the dog wagging the tail. I also noticed that snaking never seemed to occur when accelerating, only when slowing down or cruising. So, in conclusion, if I was to find myself in one of the situations described previously by others, I would seek, if feasible, to slightly increase speed using a very subtle zigzagging movement until the rig is stable then brake gently. That sounds like a very situation to be in Allan. Thanks for sharing your story, it’s great to hear from people who have first-hand experience. I have a Mercedes E350 Estate with self levelling suspension towing a 2012 Stirling Eccles Amethyst with ATC stability control, for the last 2 years the outfit has remained 100% stable at any speed. However this year I am having severe issues from 50Mph upwards. I had new friction pads installed in the hitch but the instability remains. I’ve had the car checked out for suspension, bushes, shocks tyre pressure, tracking etc & all is ok. I have tried keeping the weight in the caravan to a minimum & load the car instead, but this has had no effect. Can anyone suggest what may have happen to cause such a dramatic change in stability? It’s difficult to say what that could be. Probably best to see if anyone here as any ideas or has experienced something similar that may help you. You need to read my post to start identifying your problem – I have some issue with why it has not always been problem but for sure you need to look at the root cause – wind down the the sides of your van or anything that may affect it. I have only been towing a caravan now for about 18 months and found that loading the caravan correctly getting the nose weight right and sticking to the speed limit when towing has great benefits. It is a more relaxed drive and certainly better on the fuel economy my weight match though is 92% which i am told is high for a first towing experience but having said this my Mazda 6 is steady as a rock even when vans and trucks are passing by at speed. I have seen a number of caravans literally fly past me on the motorway and the caravan swaying from side to side. Noseweight and speed play a big role in stability John. Ref David Webb 28th Sept. Hope he doesn’t travel at 55 mph on single carriageway roads as the limit is 50. I have found that setting my cruise control on motorways to 57 mph dramatically deduces the number of HGV’s overtaking as their limit is 56 mph. I agree the fitting of the automatic anti snaking devices is a good idea, but the evidence is that badly loaded vans and excessive speed are the main cause of snaking. My only snaking experience was an indirect one on the M3 coming back from the Southampton area in very heavy rain, I was doing around 45 mph on the inside lane when big pick-up style truck overtook me with a massive boat on a trailer behind. He was doing around 60 when he cut back into the near side lane in front of me. I slowed down as the trailer and boat started to sway from side to side this became so violent that the whole outfit left the motorway crossing the hard shoulder and onto the soft grass at the side of the motorway ending up on its side this included the pick-up truck. The lesson here is also reduce speed in bad weather. By the way the towing speed limits also apply to trailers. Really interesting thread here. Have been caravanning for about 18 months now but have covered many thousands of miles including France. Before we bought our first van we chose and purchased the car to tow with! A Volvo XC 90 exec. I see so many people on the road towing with totally inappropriate vehicles it makes me mad . Really a Picasso/ Focus towing a 5 berth? We can tow our current Bailey Carolina twin axle at any speed necessary to keep with the flow of the traffic. Any body being overtaken by artics needs to look at their combination as they are limited to 56 mph (generally) , you should really be going the same if not faster than this. We find a comfortable tow of around 60-65 (more in france as the roads are so much better) keep the outfit steady but ! Having a car of sufficient mass and stability is the key , the van does not wag the car even though it is around 1900 kg loaded and 28 ft long. Towing at 45 -50 is dangerous as it makes other road users (including artics) have to avoid/overtake you. Take a moment to consider this. Higher speed is not the problem here.match the surrounding traffic speed and all will be well. The requirement in France for your outfit is 80/90 kph and in certain parts of the auto routes in the Pyrenees they cut it even lower – you have a point with the sensible tow car mass against the van – tail wagging dog but please read my long winded post. Caravans on over run brakes can never be compared with commercial vehicles for stability and have to be ranked as – be very careful with speed – if anything goes wrong it does so in a big way with a caravan – the Yanks have gone the route of 5th wheel caravans to great effect, I wish. We have read these comments with great interest. We were unfortunate to having an accident with our caravan in France 2009. We have been caravanning for over 40 years, and towed thousands of miles, so I feel it’s fair to say we are expierienced. We purchased a Geist caravan which we towed with a Nissan Primera. We were aware that the ratio was nearly 85%, and as AL-KO were advertising this new anti snake device we decided to have one factory fitted. On the day of the accident we were leaving a site in central France. A couple on the site had asked about packing and handling a caravan. They lived in a motor home and felt rather cramped and were considering a caravan as a base. As the husband was blind they wanted to know if they could manage a caravan. On the day we were departing we invited them to watch what was required. We went through everything, weight distribution, tyre pressures, nose weight and hook up procedures. We said our good byes and set of for home. 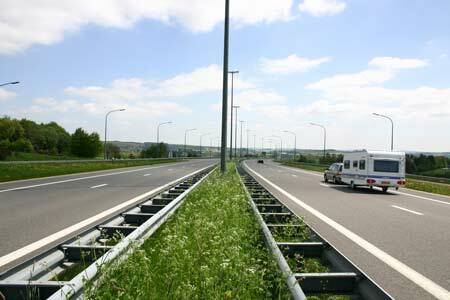 As we travelled up the motorway near Limoges, on a drysunny day with little or no wind, and having just passed a police vehicle (so not speeding) he caravan gave about five snakes, each greater than the last, until it spun us round and the caravan rolled over. As I said we had just passed a police vehicle and they immediatly closed the motorway, we dread to think of the outcome without their action. After we got home I contacted AL-KO and they asked if I could recover the control box from under the caravan. So we went back to France and got the box which I took to AL-KO. They carried out checks on their test system. Then asked some interesting questions about the last few hour of towing. The device has a memory chip that records the hours the caravan is attached to the car, and the number of times the device activates. I was able to say we had been through no high winds, road works that may have caused swaying, or any other situations that may have caused any activation. Our unit had activated 16 times in the last fwe hours. The were unable to determine what would have caused this. They also said that if the device activates several times it will switch off, which could be seen when the device light turns red. This is impossible to see whilst towing! We never have found a reasonable answer as to why our pride and joy decided to throw its self over. We regularly see people hook up without even doing the basic checks before setting off. We would like to remind them of the possible consequences. Suffering from the shock of an accident, watching strangers picking up your personal items scattered across the road, trying to decide what you need to get home, and what to leave behind, and finally WHAT DID WE DO WRONG. Icannot think of a single thing. During the snake we had little time to respond, feet off pedals, to see if caravan brakes would help, tried to maintane a straight line until the snake took over and it was impossible to hold. After the accident the police checked tyres and pressures were correct, and we had not had any blowouts. Having seen the whole incident the police were unable to give any ideas as to the cause. We are still a little nervous when pushed around by large vehicles or swaying on uneven roads, but we are still towing. Any ideas as to what could have caused our accident will be greatfully considered. Standard advice is to move as far to the opposite side of your lane as you safely can when overtaking, being overtaken or (on a single carriageway road) passing a large vehicle coming in the opposite direction. This is to minimise the effect of the sideways forces generated by such vehicles. one after the other you just feel your getting sucked into them,i say keep your speed down and consentrate its amazeing how the stabiliser works, when we started caravanning we did not have one and it was frightening. Interesting that the instruction to “control” snaking in the article is as uttered in many other places “feet of the pedals” and I’d add “and pray”. As a professional engineer I often thought this was wrong, and I believe I am vindicated by the Al-Ko ATC system. This detects unwanted movement and then gently applies the caravan brakes – this allows the car to pull the caravan straight. On the, fortunately, very few occasions in my early years towing I applied my reasoning and applied my right foot to the throttle and pulled the van out of it’s “wobble”. It can take a bit of nerve – especially when approaching a bend – but it does work. Much like the counter intuitive reasoning when cornering too fast in a rear wheel drive car – don’t take you foot of the throttle and understeer, put you foot down and generate over steer. behind me as though on a racing grid. Very, very scary. After that I fitted Tyron bands, as I have on two or three caravans since. as they draw alongside, I gently accelerate a litte until they are in front. I find this reduces the effect of the the shock wave. ref snaking, I have read all the comments, very interesting! Ref Heavy Goods Vehicles and White Van Man what I try to do when I see them about to pass me is to move over to the right very slightly, still within my lane then when they a about level with my car I move over to the left as far as I can, again in my lane, this seems to dissipate the vortex effect caused by the lorry passing. Very good advice in many comments. Fortunately I’ve never had a severe snake in some 40 years of towing experience with a varity of cars and caravans. I agree that stabilisers and ATC help, and have also found that higher tyre pressures on the towcar (within the makers limits of course) also helps, as does keeping a sensible speed (no more than the legal maximum of 60 mph on motorways) although I have noticed that many outfits still overtake! Finally, one point that hasn’t been raised. I hope that responsible caravanners think about the relative weights of car and caravan when changing either. I’m convinced that some caravanners tow with cars which are lighter than their caravan. Recently I spoke to the owner of one such outfit – we had the same car and I knew the details of his caravan as it was one we had looked at but the MLTLM was considerably heavier than the car). He hadn’t checked on the relative weights when he bought his caravan – and didn’t seem too concerned about the unbalanced outfit either. The trend is for newer cars to be lighter and caravans to be heavier. If I replaced my current car for the latest comparable model from the same maker, I would have a very unbalanced outfit indeed as the new car is some 300 kg lighter than the old model! Me again! Nick Marler and David Webb; I am in agreement. One must keep one’s speed within limits. I too am wary of downhill stretches, when speed can have a disproportionately adverse effect. Even if you are on the limit, if white van man zooms by, ask yourself how are you going to slow down if you start snaking? If you brake, even though it has a braked chassis there is a chance your caravan will feel like overtaking you, especially if it is loaded tail-heavy. Nose heavy is similarly bad but for different reasons. Tail down on car means front is loaded more lightly, which means less effective steering if you do need to correct direction. Disaster could then be moments away. If you are near the trough of the hill, you may just get away with it as you start to “pull” the caravan again. Bottom line: – Don’t exceed speed limits; drive slower going down hills; and load your caravan with care and attention to ensure good weight distribution. Further to my previous posting I am concerned that there are some suggestions that you load the caravan with heavy items. This suggestion also appears on some caravan forums where it appears that many caravaners are completely oblivious to the fact that there is a LEGAL limit to what your caravan should weigh i.e. the MPTLM. In many cases it is surprising how little the payload is which can be added to the MRO of the basic caravan. The Police and ministry of transport personnel carry out regular checks especially during the peak periods and they can direct you to a weighbridge for this measurement to be carried out. It is not unusual to find caravans grossly overweight and as well as being ordered to remove as many items as required a hefty fine can follow. I feel this is worth mentioning as overloading a caravan is one of the major causes of snaking and additionally, it could invalidate your insurance and warranty on that vehicle. Hi everyone, only been towing about twelve months and so far without incidents, although on a quiet stretch of the A1 M a while back I got up to about 68mph and realised the ‘van was starting to snake ! Feet off and all was well, its never been above 60mph since then and all’s been well. So take your time and all will be fine !. I am in complete agreement with David Webb, though it took a nasty snaking accident last summer to drive home the point. It was terrifying, though luckily the caravan ended up on the central reservation and no one was hurt. It was heartbreaking to trawl through the wreckage of your pride and joy and to try and salvage something from your treasured possessions. Worse was the way drivers looked at you as they slowly drove past the ‘fools’ who had caused the road to be closed for an hour or more. The context of the incident was that we had just come back from a trip to Europe where we traveled over 2000 miles, and being back in England I think that in my mind we were already home. To my way of thinking the major cause of such incidents is complacency. I now tow in accordance with the method David described, though being constantly overtaken by lorries means you have to be very vigilant. which is probably a good thing as you can never allow your concentration to wander when you are towing. Having read the previous articles, I agree that the contents of each are all relevant factors that can, alone or in combination, cause snaking or jack-knifing. Our second caravan, bought in 2005 was, for me, pretty good at keeping in a straight line, partly due to my somewhat pedantic attention to load distribution, the Al-ko stabiliser, noseweight, de-greasing the towball and then roughing it with fine sandpaper, tyre pressures and condition (remember, just because the tread is good, doesn’t mean the tyre is ‘safe’ – it may be an old tyre or have a flat-spot through being stood in one position too long, and rubber does deteriorate all causing blow-outs!). The worst cause I found for making my 23ft 10″ caravan was the white van man.. me keeping to speed limits and a safe position to allow passers by, but despite my efforts, HE would come along, overtaking at such speed that would cause a massive gust, and the van to snake. When we changed our van to a new one in 2010, it had the Al-ko coupling and the Al-ko ATC and boy, was I glad of it. Travelling through Belgium on our first trip in the new van, along a fairly long straight road, I had been keeping my eye on a farmer, on a tractor, in his fields. Back and forth he went, but as I got close to the field entrance he decided to drive straight out into my path at 90degrees. I swerved sharply and managed to avoid him but, putting me in a situation that would always cause swerving. Almost instantly, I felt the ATC activate and brought the van back to a straight line very quickly. Until then I had been a little sceptical about this potential ‘selling gimmick’, but have felt most reassured of the safety device since. Even so, I know it cannot be 100% effective when there are so many other factors that play a part. I am surprised at how many people have said to put heavy weights in the caravan, albeit most said low down and above the axle. Only 1 has said to put heavy weights in the car, which is better designed and able to take weights, and also better contributes to the car being substantially heavier than the caravan. Hi All. It really suprising that no one has mentioned that keeping the towball free from rust and grease and also removing any protective paint prior to using a new towball is important on all alko and bpw stabalisers also braking the glaze on both the towball and pressure pads in the hitch wire wool or emery cloth is suitable. The number of tow balls I have seen in need of attention has been quite astounding.Ihave pointed this out on a number of occasions and the response has been in the main positive and gratefull for taking the trouble. I had an incident of violent snaking when I was travelling down the M5 last year When started to snake there was no other vehicles near me and it got worst so I lifted of and let the outfit slow down on its own and when it had settled down pulled onto the hard shoulder with a sigh of relief. there was no problem with the outfit as I was towing with a Landrover Discovery and Elddis odyssey checked the nose weight before leaving. In my case all I could put the event down to was as I was travelling on the slow lane and was only cruising at 55 miles per hour was the fact that due the lorries using that lane they had depressed the road surface into 2 groves in the tarmac and that the caravan had got into these groves and was swaying from side to side up and down the edges of these groves. I am very careful when loading the caravan and put as much heavy stuff in the car as I can, I have never had trouble with lorrys passing but I do find that small transit type vans cause the caravan to wag, they come up behind so fast that it is easy to miss them coming. The other thing that I was taught on a Caravan & camping society towing course was never go down a hill faster than you can come up it and if you want to make the caravan lighter at the front, try taking off the jockey wheel and store it in the middle of the caravan. As a retired Police officer I am all too aware of the havoc that snaking can cause having attended several incidents. I have read the comments with interest and I think your respondents have covered the subject really well. Just a couple of points:- It never ceases to amaze me when towing at the legal limit that many vans overtake me, sometimes I calculate at more than the legal solo limit. One did this on a recent trip home up the M5 and just in front of me he started going into an uncontrollable snake. I braked and put my hazard lights on to warn other motorists behind as I feared the worst! Fortunately, after a time he managed to gain control but amazingly he started accelerating away again. One word of advice regarding the vortices set up by HGV’s etc., is to use your towing mirrors(a legal requirement in most instances) and perceive these vehicles approaching. When they are near, move over towards the inner lane as far as possible without going into it of course. The goes some way towards negating the effect of the slipstream. Ref noseweight. I purchased a new caravan in January and have used it several weeks this year. I noticed that it sat rather nose heavy when hitched up and checked it with a gauge. It indicated over 100kg! despite me keeping the front locker almost empty and loading the caravan correctly.An enquiry to the manufacturer by my dealer several months ago has not even had the courtesy of a reply as to the cause of this excessive weight. In my experience, noseweight is the main factor by a significant margin. I find that if the noseweght is right, recovery from a threat of snaking is almost instant. (Touch wood! – I not so stupid as to be complacent!) Years ago, I used to motor-race and towed my car on a twin axle, four wheel trailer to meetings. (Our caravan is single axle). I knew nothing of the 85% rule, anti-snaking devices etc. and I discovered by luck that by getting the noseweight right, I could avoid snaking. After nearly losing the race car during an extremely violent episode of snaking when the trailer left the ground first on one side, then the other, I paid more attention to the problem. It was trial and error and gut feeling but I became expert, for my rig at least and I avoided snaking thereafter until my wife told me I wouldn’t enjoy racing anymore (Haha!) and I concentrated on sailing! Now, if I have any singularly heavy items in the caravan, I place them securely on the floor in the centre of our caravan, over the axle. I use a Milenco noseweight gauge to avoid doubts about the weight distribution. Over time, one acquires a pretty good feeling for this and although I use the gauge, I rarely get it wrong. Easy solution, I now tow at around 55mph in UK and Continent. Always slow down on desceneding a gradient. The time lost is insignificant,MPG much better,can enjoy the ride,get there less stressed. New Affinity 540 has ADC so even better. Thanks for your comments everyone. These types of incidents can be very scary indeed, especially when travelling with passengers. Keep your stories coming! Yes I have experience caravan snaking mainly on motorway roads and it is a terrifying thing all you can do is feet off all pedals and let everything slow down, and pray. Iam of the opinion a major cause of snaking is when some of these large lorries overtake you and they are a bit too close to your unit, because as they overtake you they cause a vaccuum at the rear of there large vehicles which plays havoc with the caravan all the way up to your towing car. I experienced snaking on the M2 this august for the first time,driving a Merc 320 cdi pulling a Swift 645 twin axial conqueror (2008) and I must say it was very frightening and I was amazed how quickly it went from a gentle sway into a more violent snaking,there were lorries all around me so I assume this may have been the cause,anyway against all that I was told to do if this happened I could not stop the snaking and it seemed to be increasing so I slamed on my brakes,the car shuddered but the van straightened and we continued on our way nerviously.We are now thinking of having the ATC fitted to the van,this was a very scary experience we do not want to repeat. A caravan/ car that is properly matched and loaded properly, should tow without any snaking being in evidence. The stabiliser is there as extra insurance to prevent any outside influences causing problems. If you need the stabiliser to improve the towing then you have a problem that must be sorted before towing. In 40 years of towing, we were fortunate enough to only experience one incident of snaking. I was driving at the time, on the very straight open stretch of the M5 around Weston. Having checked the mirrors very carefully, I had pulled into the centre lane to pass some slower caravan and car units. Halfway through the passing manoeuvre (speed approx 45mph), a coach pulled out from behind me at speed, almost clipping the rear of the caravan. It sent the van into an immediate snake. Everyone else got out of my way and gave me enough room and time to slow gently and bring it under control. This was in the days when stabilisers were only just appearing, but we always took care to load carefully. These days, I still check the loading but also have the ATC fitted. In spite of that, I find that the “white van man” is the one that will still move the caravan, more so than coaches or lorries. I guess that the most common cause of snaking is excessive speed. Stick to the limits and you are unlikely to have a problem if you are correctly loaded with a sub 85% weight ratio. Also don’t be fooled in France into travelling up to their limits (83 mph on motorways!). My snaking experience was early in my towing career and due to inexperience. Basically I allowed my speed to build up above the speed limit because I forgot to back off as I crested a hill on a motorway and had pulled out to pass a lorry that also had obviously speeded up over the crest. I picked up speed to about 67 mph when a large panel van came past at about 80mph and the pressure wave set me snaking! Fortunately I recovered it, but it was a very near miss! I stick to 60mph max now and have never had another problem. 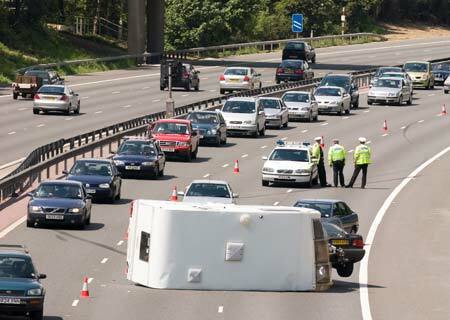 My incident happened on the M3 a number of years ago when I was a relatively inexperienced caravaner, as with most accidents it was a series of events that resulted in this near miss! I was always diligent about the nose weight, however on this occasion I hadn’t realised that my wife had packed a lot of new equipment at the very back of the van. This resulted in a very light nose weight. This was made worse by the fact that the after market anti-snaking device was in need of adjustment (the friction plates do need to be checked and adjusted). A slight movement on the steering wheel caused the oscillations to begin and they got progressive worse, I took my feet off the Mondeo pedals but the snaking seemed to get worse. I am not sure how long the incident went on for but I was very scared and feared the worse. Eventually everything calmed down and I went in to the near by services. I then checked and adjusted the nose weight and thankfully had enough tools to tighten the friction plates up to the correct resistance. I now check the anti-snake on a regular basis and weigh the nose weight at the start of every journey. I have also bought a 4×4 and my towing ratio is now only about 55%. How can you tell if tryon bands are fitted? Hi Paul, thanks for getting in touch. If your caravan has Tyron Bands fitted, there will be a sticker close to the valve on the wheel – this will indicate whether bands are already in place. If in doubt, check your manual or speak with the dealer who you bought from. There’s more information on the Tyron website too.